The latest Android OS version, Android Oreo, released on August 21st right in time with the Great American Eclipse. The latest version was deliciously named following the ritual to name Android OS versions on something sweet. Picture-in-picture – This feature allows you to see two apps in one screen, so you can do a Whatsapp video call and check your email at the same time. That is cool! Notification dots – A small dot will appear on the app’s icon when you receive notifications and with a long press on the app icon, you can have a small view of the notifications right there. Apart from the above eye-catching features, Android Oreo includes many subtle, behind the scene features like improved battery performance, new emojis on the Google keyboard, adaptive icons, background location limits, notification categories/channels, notification snoozing and a smart WiFi assistant. Unlike iOS, Android still does not support GIFs or videos in its Rich Push Notifications. After reading this blog post, you will be able to build push notifications using the latest features of Android O, i.e Notification Channels and Notification Badges in your app. I am also assuming that your app is using one of Firebase or GCM service providers for push notifications. If not, you can setup your app on Firebase and go through their documentation to use it in your app. 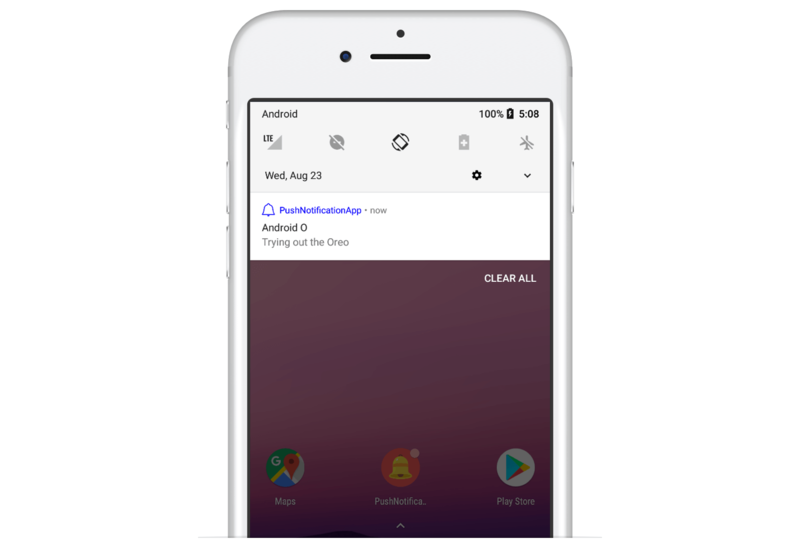 Starting with Android O, notification channels allow you to create a custom user-controllable channel for each type of notification you want to display. When you target your app to Android O, you will have to implement one or more notification channels to display notifications to your users. If you don’t target Android O and your app is used on a device running Android O, then it will behave the way as it would on Android Nougat (7.0/7.1.1) or lower. Configure the NotificationChannel object to the settings of your choice like alert sounds, lights and importance. Submit the notification channel to the notification manager. Creating a notification channel with the same name and settings again doesn’t cause any problem, so you can create the notification channels at the launch of your app. The new Android O launched a cool feature called Notification Dots/Badges which show notifications that a user has not dismissed on a long press of the app’s icon. By default, each new notification in a particular channel will increment the number displayed in the long-press menu. You can change the number appearing by setting a number of your choice while building the notification. "to" : "Your FCM Token"
That’s it! This is all you need, to try out the cool new notification features of Android O. In part 2 of this blog, I will help you understand how you can use CleverTap to leverage these features without any coding hassle. Stay tuned!